« Hated Workwear Design Details: Exposed Zippers, Shiny Fabric, Sharkbites, and More! Does anyone have suggestions of a good divorce lawyer in Northern Virginia? I have a friend who might be headed that way and needs legal advice of how to prepare. TYIA! Christian Lapham with Bean Kinney & Korman in Arlington, VA. I used him for my divorce, which was amicable, but got the sense that he could step it up if things started to go south. Please let him know Jennifer recommended him. And I’m sorry for your friend. The process s*cks, but I came out much happier on the other side. I like this mobile battery – it’s almost the same price, but more versatile and has more juice: http://www.amazon.com/Jackery-Portable-Battery-Charger-External/dp/B00AANQLRI and there are other sizes if you need one to fit in a small handbag. I keep one in my purse and one in my beach bag. And I’ve given it as a gift to both my brother and my brother-in-law. It’s awesome. Thanks Wildkitty – I like this one better. My dad got me a nice one b/c my Iphone was ALWAYS goeing dead on me, so I carry it all of the time. It is VERY powerful, and heavier then the Iphone itself! Why don’t they just make iphone’s with better batteries? FOOEY on iphone batteries! I have a question for the hive: Has anyone seen the TV Show on HBO called Ja’mie? It is all about prep school girl’s in Australia. Myrna has it on HBO GO on her Ipad, so I watched it when we were in the Hampton’s. I was watching the main star, Jamie, and I thought she was realy hideous, and I could NOT understand why all the other girl’s liked her so much. Plus, she was NOT a nice person either. After watching a full episode I wondered why anyone would watch such a gross person? I then found out that Jamie was a MAN, not a woman, which explained why she looked so gross. OMG!?!? Does anyone agree with me? Am I wrong? Has anyone else seen this show? 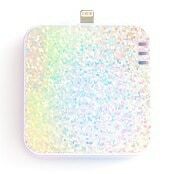 I have this one and it will charge my iPhone four times. It’s been a total game-changer! Well, that charger is less likely to be stolen in an airport than a standard version. For those who like Ivanka Trump pointed toe flats- off 5th has them in black leather for $60. How do they fit? I’m a 9, but shoes that stretch are known to slip off (particularly heels, but sometimes flats). I don’t know yet. I ordered a pair. Some readers here gushed about them recently, so I looked around to find them on sale. Every shoe in my closet has been a size 9 since high school (I’m in my 30s), and these are no exception. They don’t stretch out. I like her shoes, but wearing anything with the Trump name on it is offputting. I hope they eventually rename the brand so I can forget about who owns it. I’m looking for suggestions for London. I love antique maps, and my husband likes old books. Any good dealers or galleries to recommend? We also like photography, mainly of the natural world (no people photos). Would appreciate gallery suggestions! There are a string of streets near SoHo and Leicester Square (the streets run between St Martins Lane and Charing Cross Road) that is full of antique books, maps, and art–so lovely! The British library has a permanent gallery of early books, maps, musical scores etc… They also have a changing exhibition space close by. My husband and I can spent a few hours there. Some of the rooms in the British museum also include maps, and occasionally the museum of London will have exhibits related to what you mentioned. Check out special exhibits at various galleries before you go as well. How did you know you were ready to get married and/or your SO was “the one”? ooo good question. I can’t wait to hear the answers to this one! I don’t believe in “the one.” A lot of marriages come down to timing, right? When both people are ready for the next step? In my case, we both had big life changes ahead of us, and I knew I wanted a firm commitment in order to plan our future together. Because the entail couldn’t be broken. I wasn’t so much ready to get married as I knew I wanted him to be my partner permanently. When both people feel that way, it’s really obvious and it makes things just seem really easy. So of course timing is important (both people need to feel the same way) but the most important thing is finding someone who’s a really really good fit for you, not just a decent fit. I know plenty of people who’ve ended up with a decent fit, but there’s often a lot more agonizing to get there and the relationship overall takes more work. In my experience, someone who’s a 95% fit for you is going to feel really easy and obvious like duh of course I want this to be my person. Ditto for me. I am someone who is never 100% about anything, but who usually just weighs the odds and goes with a decision… but for my husband, I just KNEW. I knew my life was better with him, I knew he was my favorite person, and I knew I wanted to spend my life with him. Oddly enough, we were friends for several years before dating and I totally didn’t see him in that light– but as soon as I did, I realized who right it was nearly immediately. I think relationships are supposed to be easy and when they aren’t there is either a problem with the person you are with, or potentially a problem with you. When you are ready and you find the right person, things just click. Knew he was the one: Pretty much immediately I just felt like I knew he was the person I would spend the rest of my life with. I had been in only one other serious relationship, and although I liked the guy and he was very good to me, it just felt completely different with my husband. It’s the only time I’ve been in love, at least in a reciprocated, adult way. I also never really felt a strong desire to have kids growing up or when I was dating anyone previously, but as soon as I met my husband I felt very strongly that I wanted to have a kid with him (someday, not immediately) so I think that was another strong sign. Decided to get married: From the beginning (and I mean very beginning, like the second or third date) we talked about getting married the summer after he finished graduate school. It was always a question of when, not if, but we even had a pretty similar time frame. About 1.5-2 years before the date we had talked about I started feeling ready to get married. I think it was a combination of wanting to get engaged so I could start planning (I’m incredibly type A) and having other college and grad school friends start getting engaged, because we were at that age (25). We ended up getting engaged within 6 months of when we first started talking about, I had about 18 months to plan and we kept our original wedding date. When he was “the one:” When I was genuinely happy and proud of him for his accomplishments, and didn’t feel the need to one-up him. Sad but true. When I realized that this had happened, I took a look at our other interactions and found that we made just a really great team – we think of things differently but complimentary (most of the time). When we compromise on something, it doesn’t feel like I “lost” anything. We have the same goals in mind, even if our pathways to get to those goals differ slightly. However, we know each other and communicate well enough to know what each other’s boundaries are. It’s a very yin and yang sort of thing we have going on. Like L in DC says above, it was just a really easy and “duh, there he is” sort of thing for me, which was reciprocated. I wasn’t ready to get married, but I did want to have him in my life permanently and *he* was ready to get married. We had ascertained that we had compatible values and similar approaches to finances, religion, children, lifestyle, etc. He had demonstrated that he would prioritize our life together, communicate openly, and be kind and generous to me, my family, and our community. I looked forward to talking to him more than anyone else. He made me feel inspired to be a better person, and we both felt we could achieve more together (education, career, family, philanthropy) than we could individually. And I find him attractive. There’s probably someone “better” out there – the world is full of people, after all – but I hadn’t *met* anyone better and I wasn’t willing to throw away a lovely, practical, fun relationship in order to find that someone better. We both believe that there is no “one” – how difficult/disheartening if there were only one! – but that we chose to become each other’s “one” the day we married. It wasn’t at all a clear decision (how can it ever be clear that *this* is the person you should definitely promise to spend the next 70 years with? ), but after careful consideration, sometimes you just have to make a choice. I’ve only been married six years so far, but I’m confident it was the right choice. These are lovely sentiments. I hope you have many more happy years together! It was totally obvious to both of us right away – the epitome of “you know it when you see it”. I’d elaborate to say things were just easy with us in every sense of that word. Other relationships always had something that wasn’t quite right. I have a foot/bunion related question. Apologies in advance if this is TMI. I have a good sized bunion on my right foot. I try and wear quality, supportive, mostly flat shoes but it’s been getting worse. Starting last night I have a sharp pain radiating from the point of the bunion down my arch and up towards the join of my big toe. Like painful to walk, not just a little ache, pain. I’ve been putting off a visit to the podiatrist but think it may be time. Anyone out there have positive bunion surgery stories? My mom had it and it was awful. Thanks! So, I had a similar issue, which was strange to me because I don’t wear heels and there was no obvious reason for me to be experiencing bunion pain. I did some googling and found a bunch of people talking about how tight calf/ankle muscles can create bunion pain. I followed some of the self-massage instructions and figured out that my inner ankle/lower calf area had this spot that was extremely tender and sore when I pushed on it. I massaged it pretty hard and lo and behold the bunion pain immediately went away. It took a few weeks of doing this regularly, and now I no longer have bunion pain. I also started stretching my calves a lot which I’m guessing probably helped as well. The pain still occasionally crops up, but then I poke around my inner ankle/calf to find the tender spots and the pain is always gone after a quick massage. Hope it works for you too! Physical therapist here – it’s a long healing process, but people I’ve seen months or years out are usually happy with their results. Maybe not completely pain-free, but definitely better than prior to surgery. I agree with DC Anon stretch and see either a massage therapist or physical therapist who does manual therapy to see if there’s anything else you can do conservatively before deciding on surgery. I have a similar pain to the one you describe. I agree with the suggestion about the gentle stretching and massage. My podiatrist suggested that I wear shoes that are fairly rigid with a slight wedge. He explained this to me by showing me that if he could bend my shoes, they were too loose and did not support my foot, thus causing the bones and my bunion to hurt. Your feet need to be secure in the shoe, but not hurt. He did add however, that if I was standing, or not walking far, standard “fashion shoes” could work, but to buy supportive shoes, and wear my orthotic for longer walks, as walking in an unsupportive shoe can actually cause more pain. I have a bunion on my big toe on both feet. One is definitely worse, but they’re both painful at times. I bought splints, and when they start hurting I wear them at night. There are also toe spacers that I’ve used with success. I also force (gently) stretch my big toe “out” and try to do it often when I’m wearing shoes that I know will irritate it. Not a medical doctor, so obviously take what I say with a grain of salt. I also just bought socks with padded separators to stretch my toes….hope you find something that works. I don’t want the surgery so I do everything I can to manage it! After the sheets article last week, I thought I’d give linen a try and ordered a pillowcase from Rough Linen (didn’t want to spring for the duvet cover until I was sure I liked linen). It’s still sort of stiff and a bit scratchy. Is this normal? Is there supposed to be a break in period? I’ve never had linen sheets and I’m not sure how soft they’re supposed to be compared to cotton (previous sheets were percale). Ask on Apartment Therapy – I think linen sheets are supposed to be stiff but will soften and get amazing with time. You might try washing it a few times to soften it up. Yes, linen needs to soften. It should soften after 3 or 4 washings. Does anyone have a recommendation for a snazzy way to organize too many cables. It’s out of control in my home office, between the computer, printer, two monitors, modem, router, VoIP phone and various other devices. Would love for it to look tidier. Zip ties! You can also look at cord management on unclutterer or pinterest. +1, also I am a huge fan of the shove cables behind furniture look. On a more serious note though, I saw one interior designer cut out the back of a decorative box (whichever side is going towards the wall) and put it on a shelf/bookcase/desk/etc. Things like modems, routers, etc that you don’t often need to access can be hidden inside the box with just a single extension cord coming out the back. That being said, I would worry about the devices overheating, but the decorator said she had never had an issue with things overheating and had been using that way to hide electronics for a while. I have plastic slinky tubing (kind of like the hose on a vacuum cleaner, but narrow) that holds a bunch together. It was to keep my cats from chewing on the cords, but had the bonus effect of making them more organized. I’m not sure what it’s called, but I got it at home depot in the electrical aisle, I think. It has a slit down the center so you just stick the cords in. I ruptured my Achilles’ tendon over the weekend. The orthopedist I saw today gave me surgical or non-surgical options. He said most people have surgery, but since I’m not an athlete, I should consider not having surgery. In his opinion, long term health wise, it shouldn’t matter which I choose. If I chose surgery, I will have to wear a short cast (from my toes to just below my knee) for 4 weeks and wear a boot for 3 more. I’ll be on crutches for about a month and a half. If I don’t have surgery, I’ll be in a full cast (from the top of my thigh to my toes) for 6 weeks, a short cast for 6 more and a boot for a month or so. I’ll be on crutches for at least 2 months. For the record, I am a 31 year old woman, who lives by herself with no family in the area. I am fairly active but luckily, I have an elevator in my building and it’s my left leg so I can drive. Which should I choose? Obviously, I don’t want surgery, however, a cast from the top of my thigh to my toes is huge. I can’t imagine how uncomfortable it would be. Does anyone have any opinions??? Right now I’m leaning towards the cast option but don’t know what to expect since I’ve never had one. I would totally go surgery instead of hip to toe cast for 6 weeks. YMMV. Do you know what your out of pocket costs on the surgery vs. non-surgery option will be? If surgery is going to run you into the 6 figures and you don’t think you’d have too much trouble getting around in the tall cast, that might be enough to consider the longer and more awkward, but cheaper and less invasive non-surgical option. YMMV. Cost wise, non-surgical would be cheaper (probably a few thousand dollars, which I have in the bank) and I wouldn’t miss as much work. I’m just not sure how bad a tall cast would be. I’m in a splint right now but am staying mostly in bed because of meds. OMG I would totally do the surgery and get the whole thing behind me sooner rather than later.I think a tall cast would be horrible. I screwed up the original post…it will actually be 3 months, not weeks, in a boot if I have surgery. I’m leaning towards not having surgery but I’m just not sure how awful casts are since I’ve never had one. I’m the PT who answered the other foot question. Personally, I would have the surgery, but I am active. The people I have seen post-surgically usually still have some pain and weakness even 1 year out, but I have not seen anyone who has chosen non-surgical. The evidence suggests either is a valid choice. Just make sure you see a PT either way. A recent metaanalysis “shows that surgical treatment and nonsurgical treatment using functional rehabilitation were equivalent with regard to rerupture rate, range of motion, calf circumference, and functional outcomes”. I’ll try some links in a separate comment. You wouldn’t be able to drive with a hip-to-toe cast, because your leg would be straight out. The foot “compartment” in a car is too low to accommodate. You would also have a hard time showering (yard-size garbage bags with a rubber band -fun! ), getting in and out of the tub, stairs everywhere, etc. It’s amazing how many stair-only buildings there still are.